You have received your offer of payment, but what should you do next? This section answers any questions you may have with regards to billing and invoices. The lender has just put the money in my account – what do I do? Although the lender has paid the redress, we still need to check the decision they have made on your case. In some cases, lenders only refund partial amounts of the premiums paid on a policy. Since the ‘Plevin’ rules were announced by the FCA, lenders may reject the case for mis-selling but admit that a high level of commission was involved in the sale which was not disclosed to you. 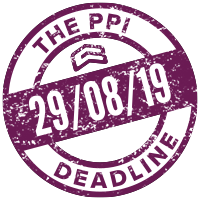 In these cases, they should offer a refund of any commission over 50%, however we would check this and look to appeal the PPI rejection for you. Now I have received my money, how do you get paid? As advised at the start of your complaint, we are due 20% + VAT° of the total redress offered by your lender, including any reduction of any outstanding agreement, which if in place the PPI may be cancelled. This will not have been paid for by the lenders separately and therefore you need to pay our invoice once it has been submitted. Therefore, it is important that you do not spend all of your redress without taking into account that you owe Gladstone Brookes’ fees. I have spent the money and cannot afford your fees – what should I do? This action would be a breach of your contract with us and we will discuss several options for you to settle with us, before we take further action. You should contact us to let us know what has happened, so that we can discuss the options with you and see what we can do to rectify this problem. The best way to avoid this situation is to keep the amount of money for our fees to one side. The offer letter says that I am receiving my full premiums – why do you need to check it? In some cases some lenders do not offer full redress therefore we need to review the decision letter’s wording and calculations. As part of our service, we do all we can to ensure that you are getting the correct amount that you are entitled to. If we do not challenge any incorrect offers quickly, we will lose the opportunity to do so and it may result in you losing out. The process seemed very easy to me – why should I pay you? By agreeing to our terms and conditions at the start of the process you agreed to pay our fees in the event of a successful claim. If we have applied and/or appealed for the reimbursement of your PPI payments on your behalf and were successful, then we are owed the fees outlined in these terms and conditions. If the offer is correct, what happens next? Provided we are both happy with the offer that you have been made, all that is left to do is to get you the money that you are owed. We have a department dedicated to this, who ensure that you are paid by your lender, without the need for you to chase the release of the money that you are owed. When am I going to receive your invoice? Once the offer that has been made is accepted we will calculate our fees and send you an invoice as soon as possible. This may be after you have received the money and therefore it is important that you keep some of your money to one side to cover our fees. If the invoice arrives before you receive your money we do not expect you to pay it until your money has been sent to you by the lender. Visit www.gladstonebrookes.co.uk/pay and choose the best option that suits you. Call 01925 320 904 and pay via all major Credit or Debit Cards. Payment via a Cheque to ‘GLADSTONE BROOKES’, with your reference written on the back of the cheque. We will enclose a Stamped Addressed Envelope for your ease. I have received an offer – what do I do now? It is essential that you contact us to let us know the figures that you have been offered. It is highly likely that we will receive the letter, however, we want to ensure we check this as soon as possible for you to ensure it is a full offer. I do not understand your invoice/charges – what should I do? We try to keep our billing processes as simple as possible, however, if you do not understand the charges after reading this Information Suite and the literature we have sent previously, please do not hesitate to call on 01925 320 904. Each lender will pay the redress differently, making this question impossible to answer without dealing with the specifics of your complaint. Some lenders will pay you at the same time that they make the offer and others will require acceptance forms and separate calculations which may delay your money being released. As we are aware of this problem, we have processes set up to manage communication with all lenders via the most appropriate channels. This allows us to chase them whenever necessary by any method we have available to us. If you have any concerns about your payment please call on 01925 320 904.